Group One Investigations is a well-established private investigator agency with more than 20 years of intelligence and surveillance experience. We believe that you deserve to know the truth of a situation and that the best decisions are made when a person possesses the full range of information available to them. We aren’t just in the intelligence game, we’re in the truth game. To that end, we have a robust selection of specialised services available to our clients, including basic activity reports, exposing spousal infidelity, conducting background checks for both corporate and private clients, due diligence, finding missing persons, covert surveillance operations, corporate fraud, identifying security weaknesses, performing bug sweeps, identity theft, the sale of security equipment, and more specialist services. Our office is located in Melbourne and boasts a sizeable international database. We can call upon a vast network of foreign detective agencies, and other overseas assets, and can operate domestically and internationally at any time, with very limited notice. We utilise a myriad of resources to aid each investigation, ranging from our years of experience and competence in investigations, to the most up-to-date technologies and systems available in our field, and the cooperation of overseas agencies and operatives. Whenever and wherever you need an investigation, Group One Investigations can procure the manpower. We are diligent in our enterprise and exercise the utmost determination in providing you with actionable intelligence. We provide discreet professionalism and objective information and, if ever you’re unsure of your own decisions, we can offer recommendations on the best course of action through each step of our investigation. We have dealt with numerous cases for a varied range of unique clients, and our scholarship and wit in our vocation ensures that we always achieve the optimum result under the circumstances. With over 20 years of experience in the industry, you can rest assured that we operate under the strictest of confidence agreements. All Group One Investigations members are licensed by the Australian Government and we conduct all of our operations, and resolve all of our cases, within the parameters of the law. This means that you can comfortably rely on our services to provide you with intelligence that’s suitable for use in legal proceedings. For example, an inexperienced and unlicensed investigator may unintentionally uncover evidence through unlawful means and, consequently, this information will be rendered unusable in court, ultimately wasting valuable time, effort and money. It is always best to hire a licensed investigator so that you can enjoy peace of mind. We not only employ investigators with an abundance of experience and proficiency in their trade, but also specialists in military and police intelligence, and lawyers who are exceptionally adept in the corporate and private sector and who are familiar with the complex minutiae of legalese. Through this eclectic range of diverse professional backgrounds, we are capable of covering extensive ground in our investigations, and ensuring a cross-disciplinary solution that leaves no stone unturned. Our Director favours a hands on approach, meaning that when you hire Group One Investigations, you aren’t getting just one investigator working on your case, you’re getting the resourceful application of our craft from our whole team. We enlist all of the resources necessary in our business, from the Director to all case investigators, to ensure your satisfaction. This lateral employment of our talent enables around the clock focus on your investigation. Your case is given the utmost priority and we will always utilise the full weight of our agency to ensure the best possible outcome for you. We hold discretion in the highest regard and, as such, we conduct all of our operations with unwavering consideration for your confidentiality and will guarantee your anonymity. No one will ever know who has hired us for an investigation unless, of course, it is your intention to become known to the subject, such as if you have hired us to locate a long lost friend or family member that you have fallen out of communication with. As an accomplished private investigation agency, we are confident in our capabilities and experience. 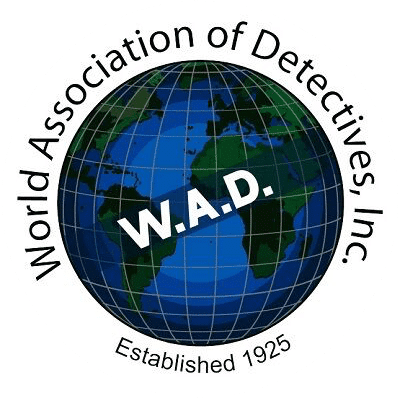 We are members of the World Association of Detectives (W.A.D.) and are held in high esteem by our community of peers. Our regular clients entrust us with their objectives and we want our new clients to view us with the same commendation. To that end, we provide a free consultation so that you can enjoy an obligation-free chat, and have an insightful and collaborative discussion about your case and how we can assist you. We can also offer a quote based on what you’re able to tell us about your intended investigation and the desired outcome. Having the most information on the person of interest available when we meet, and being as forthcoming as possible, will help to give us the clearest picture and the best head start in our operation, ultimately saving on costs.